When Matthew and Emily Reichardt had their first baby, like us, they looked for that perfect stroller. They loved the beautiful designs coming out of Europe, but the prices were almost as much as an airline ticket to get there! The Reichardts also wanted something more stylish than the big box store brands that were everywhere, but with the same convenience features. And so they began taking notes. 2 Your Bumbleride Stroller – Now eco-friendly! A year later, in 2004, Bumbleride was created. Matthew and Emily came up with a stroller that had fabulous European streamlined design, fashionable colorful fabrics, plenty of parent amenities and priced within the mid-range budget. This husband and wife team think about how to transport your baby from one point to the other with ease and safety. They think about the logistics, especially in urban settings such as using public transportation, going up stairs into apartments, or getting your stroller in and out of a car. Its function changes as your baby gets older. A newborn has different needs than a toddler and each Bumbleride product takes this into consideration in its clean and simple designs. Your Bumbleride Stroller – Now eco-friendly! 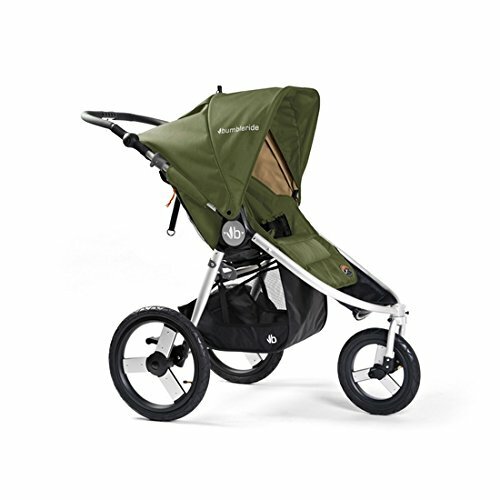 The materials used in each Bumbleride stroller is now more eco-friendly than ever. Beginning in 2013, Bumbleride has since been using recycled plastic water bottles as part of the materials used in the exterior fabric. About 14 bottles are used with the production of the Indie. Interior fabrics are made with bamboo charcoal, where the particles are infused with polyester. Bamboo charcoal has beneficial properties such as moisture absorption, anti-bacterial and temperature stability. The fabric in the seating area is soft and comfortable for your baby. Soft, cushy, and sustainable. 1. Full 360° rotation for walking. 2. Partial 30° locked rotation for jogging. 3. Fully locked forward for jogging or running. This Bumbleride stroller has 2 rear 16″ inflatable wheels and a 12″ wheel in the front. An air pump is included with purchase and has a special pocket for storage in the under-seat basket. Weighing only 24 pounds, the Speed has a 65 pound carrying capacity, so you can take your child with you on your workouts for many years! You will love the UPF 45+ sun canopy with peek-a-boo window and huge flip-out visor for full coverage on sunny days. The strap recline in the seat leans your child back at just the right angle for a nice nap and the 5-point safety harness keeps your passenger snug. Your child feels secure with the included padded bumper bar. Ring the little bell like a bike to let others in front of you know that you’re coming! An easy fold, easy braking, and height adjustable handle make your experience smooth and seamless. At the time of writing, this is a new product, so there are few reviews for the Bumbleride Speed. 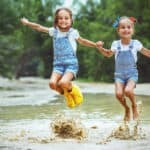 But so far consumers are giving it high praise for the clean and stylish eco-friendly design, easy maneuverability, and rugged stability. 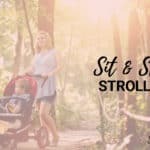 Want an all-terrain or jogging stroller without all the bulkiness? 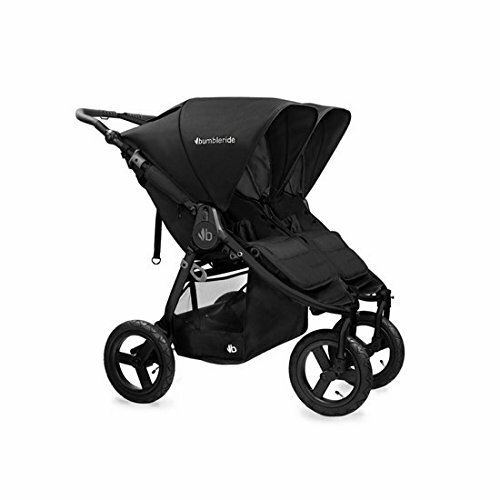 The Bumbleride Indie is specially designed for a compact footprint and simple operation. Weighing only 20 pounds, the Indie holds your child up to 45 pounds. Newborn babies can ride in the seat because of the flat recline and the footrest comes up to form an enclosure. Or if you’d rather have a travel system, a universal car seat adapter is included that accommodates such brands as Graco Classic Connect, Peg Perego, Chicco, Combi, Baby Trend, and Britax. Weighing only 22 pounds, the Indie holds your child up to 45 pounds. Newborn babies can ride in the seat because of the flat recline and the footrest comes up to form an enclosure. Or if you’d rather have a travel system, a universal car seat adapter is included that accommodates such brands as Graco Classic Connect, Peg Perego, Chicco, Combi, Baby Trend, and Britax. A padded 5-point safety harness keeps your child snug and secure, and the SPF 45 canopy is enormous, offering plenty of protective shade from the sun’s rays. An adjustable footrest, multi-position reclining seat and padded bumper bar complete your child’s comfort. Parents, your amenities are fantastic as well – customize the handle height to fit your stride. Put everything you need to take with you in the generous storage basket beneath the seat. Bring your favorite drink using the included cup holder. 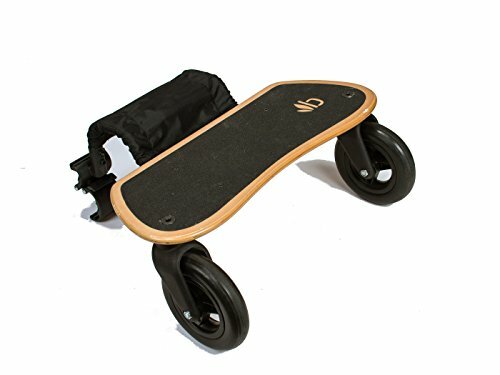 The many reviews out there give the Indie fairly good ratings for the durable smooth ride, great maneuverability, and easy storage. 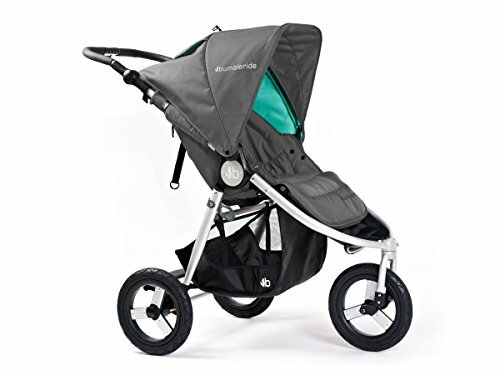 Read more about this multiple award winner in the Stroller Envy Review. 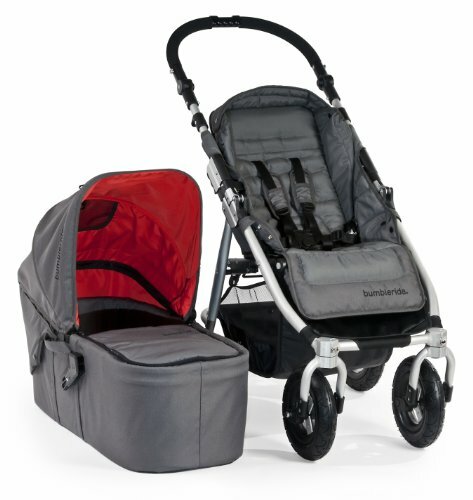 The Bumbleride Indie 4 is for those who want a rugged all-terrain stroller as well as one that is super using for everyday errands. Because of the extra air-inflated tire, the weight on the Indie 4 is 22 pounds vs. the 20-pound 3-wheel Indie. It also has a higher weight capacity, accommodating 55 pounds. The all-wheel suspension system gives your child a smooth ride, whether on bumpy trails or along a city sidewalk. 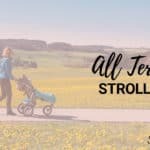 It’s a very versatile stroller, and other than the weight differences mentioned above, it’s the same as the 3-wheel Indie, so you should read that review for more on the stroller. The photo you see above is for the stroller plus bassinet. 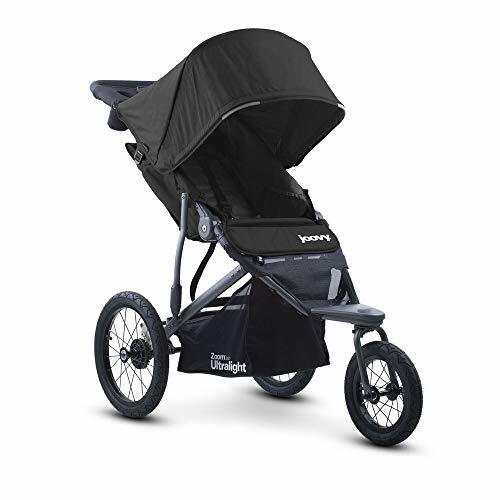 The bassinet uses the stroller’s sun canopy, which is cost effective AND that sun canopy is huge! It’s going to give your newborn complete protection while you are out and about. The seat reclines completely, and your bassinet sits right on top. Or if you prefer to use your car seat, an adapter, included with purchase, will accommodate Graco, Peg Perego , Chicco and Britax. 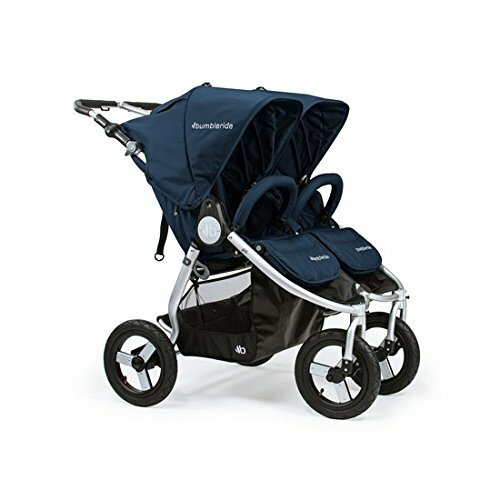 One of the most popular all-terrain double strollers, the function, quality and colors of the Bumbleride Indie Twin are hard to beat. 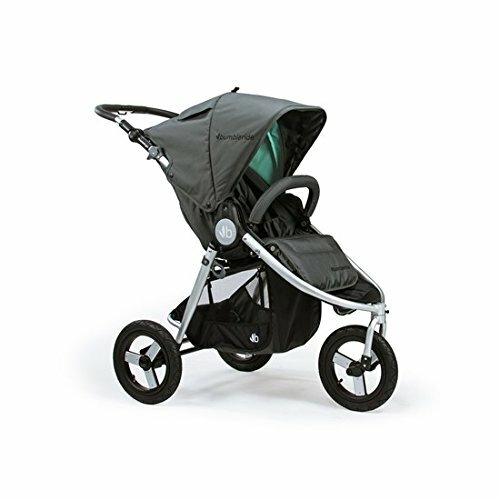 First off, this is a fantastic stroller for twins because it accommodates two infant car seats or carrycots. If your two children are different ages, everything on this stroller can be customized to fit your child’s needs. Adjustable big sun canopies, easy-fit padded safety harnesses, leg rests and multi-position reclining seats give each child optimum comfort. The Indie Twin is rather narrow for a side-by-side stroller. At only 29-inches across, access through doorways and aisles are a breeze. Parents, you get many cushy features, too. Adjustable-height handle bar, a generous storage basket, and 12″ inflatable tires give a smooth ride and effortless push. Reviewers rave about how well it goes over different terrain, from beach sand and grass to rough trails. They love all the color schemes to choose from, and are constantly getting compliments.